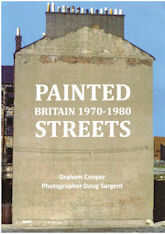 This book contains a selection of British street paintings from the seventies by those who were bringing art to the people. Collated and re-assembled by Graham Cooper are artworks featured in the Painting the Town exhibition he produced with photographer Doug Sargent. For a decade 1974 to 1984 there was an extraordinary outbreak of street painting which was to kick start a growing interest in environmental design across the UK and Europe. The street murals of the seventies represented a vigorous form of urban folk art, which was produced by the people and accessible to all. Painted Streets is an attempt to capture an extraordinary grass root art movement by the people and for the people. It is a compilation based on two separate versions of the “Painting the Town” exhibitions which were toured widely by the Arts Council of Great Britain, and later, the British Council. In 2014 the author had the pleasure of donating a large slide collection he and photographer Doug Sargent had assembled to the English Heritage photographic archive. The unique collection consisting of over four thousand pictures feature photographs of UK outdoor wall paintings and many other kinds of urban decorative art, the majority of which were taken in the late 70’s. Now listed as the Art and Architecture Slide Collection at English Heritage it is a record of the human creativity and artistic touches which make life in cities more tolerable. Produced by Harmonie Press 2014 Format: A4, Pages 124, Price £15 (incl UK P&P). Please enclose cheque to G Cooper for £15 sterling (per copy).